Member of the ANC, MK, SACP and Cosatu, Deputy President of the ANC, third President of democratic South Africa. 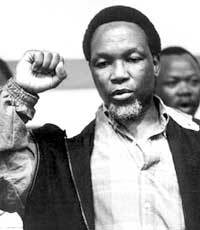 Kgalema Petrus Motlanthe was born on 19 July 1949 at the Boksburg-Benoni Hospital. He grew up in Alexandra, Johannesburg, Transvaal (now Gauteng). His parents, Louis Mathakoe Motlanthe, a cleaner and Masefako Sophia Madingoane, a domestic worker married in 1946. Motlanthe (also known as Mkhuluwa, the elder one) has two younger brothers, Tlatlane Ernest and Lekota Sydney. Motlanthe’s maternal grandfather, Kgalema Marcus Madingoane and his grandmother, Louisa Mmope Sehole lived in Apex, a squatter camp on Benoni [East Rand, Transvaal, now Gauteng] Old Location where they moved to in search of work. Here, Madingoane became involved in community affairs and eventually became a Councillor in Apex. He was instrumental in founding the township of Daveyton in 1955 where he ran a funeral parlour and a general dealership. When he was 11, his parents were forced to move from Alexander to Meadowlands [Johannesburg, Gauteng]. He first attended school in Ga-Mothiba, Northern Transvaal [now Limpopo]. Motlanthe returned to Alexandra and enrolled in Grade 1 at an Anglican Missionary School. The school was eventually closed when the administration refused to implement Bantu Education. After this, he attended the Totomeng Lower primary School in Meadowlands and then went to Meadowlands Secondary School, walking several kilometres to and from school. He then enrolled at Orlando High School (also in Johannesburg). He completed his matriculation on Robben Island years later. Motlanthe’s parents were practising Christians, which influenced his outlook on life. He served as an altar boy and at one point intended to enter the Anglican priesthood. Family and friends described him as a gentle and kind person. He was a talented soccer player and even played professionally. The manager at Spa Sporting, a soccer club in Atteridgeville that he played for, was Russa Bud-Mbele; son of the second Secretary General (SG) of the African National Congress (ANC), Isiah Budlwana Mbele. Motlanthe held Russa Mbele in very high regard and considered him to be a mentor. In 1964, the Anglican Church awarded him a bursary to attend St Christopher’s in Swaziland to complete his secondary schooling and then enter the priesthood. His application for travel documents to the Bantu Affairs Department was turned down and they informed him that he had to study in South Africa. His political interest was aroused after reading The Anglican priest, Father Trevor Huddleston’s, Naught for Your Comfort. The American Black Panther Movement and the rising Black Consciousness Movement in South African also played a role in shaping his political awareness. Whilst at high school he worked part time at a bottle store in Hyde Park, Johannesburg. In 1969, he began work in the Johannesburg City Council, supervising liquor outlets in Soweto. Stan Nkosi, his closest friend and comrade, Siphiwe Nyanda, former minister of communications and George Nene, deputy director general in the foreign affairs department also worked in this unit at various times. Together they later joined the ANC’s military wing uMkhonto weSizwe (MK). During the seven years that he worked there, Motlanthe was able to engage in underground work such asgoing almost weekly to Manzini, Swaziland couriering ANC recruits for military training. In 1975, he married Mapula Mokate, from Sophiatown. Mokate was a radiographer at Baragwanath Hospital, Soweto. The couple have two children, Kagiso and Kgomotso. Motlanthe, Stan Nkosi, Siphiwe Nyanda, and George Nene formed a MK cell around 1973. In 1974, Motlanthe went to Matola, Mozambique where he attempted to contact the ANC. The cell began to explore routes from Mozambique and Swaziland to the ANC office in Tanzania. At the same time, he began taking people out of South Africa to Mozambique and Swaziland. The cell was so successful in the venture that they were never once caught. In 1975, the cell was instructed by the ANC to turn to sabotage. Joseph Nduli, the ANC’s Natal [now KwaZulu-Natal] underground leader supplied the unit with explosives. Nduli was arrested on 18 March 1976. Under severe torture by the Security Police, Nduli was forced to reveal Stan Nkosi’s real name. In turn, Nkosi, under torture, disclosed Motlanthe’s name. This led to him being arrested on 13 April 1976. Motlanthe was arrested under the Terrorism Act for MK activities and he spent 11 months awaiting trial. Motlanthe, Nkosi and Joseph Mosoeu stood trial in the Randburg Supreme Court. Motlanthe and Nkosi were found guilty of furthering the aims of a banned organisation, the possession of explosives and of having undergone training for sabotage. They were sentenced to five years on each charge to run concurrently but were effective for ten years. They were held at Leeukop Prison where they were badly beaten by white warders. On 31 July 1977, they were transported to Robben Island along with other prisoners. Motlanthe commanded the respect of his fellow prisoners and soon was involved in welcoming and orientating new prisoners to the Island. He served on the political committee, which was responsible for political education of prisoners. He was responsible for the political study material ensuring that he was able to source it and make it available for use. His relationships with prisoners from the different political parties were equally good and this certainly elevated him in the eyes of all those with whom he shared incarceration. At the same time, he would challenge injustice when confronted. On the Island, he once challenged a fellow prisoner to a fight when the perpetrator continued to bully fellow prisoners. The man was embarrassed and walked away. Motlanthe served on the disciplinary committee in the general cells on the Island. He also chaired an inter-organisational structure that brought together all the different formations on the Island. Under the repressive conditions, Motlanthe played a key role in keeping the spirits of the prisoners “from flagging.” He told jokes, he centralised the different sports committees into a more unified one with Nkosi, and he supported traumatised youngsters from the 1976 Soweto and the 1984 Vaal uprisings who came to the Island. In 1979, he embarked on correspondence studies to complete his matriculation, followed by a course in carpentry. That same year he enrolled for a B.Com degree through Unisa but for various reasons did not complete it. At the same time, he studiously devoured any political and other literature he came across. He learnt to play the flute and with the help of a manual, he eventually learnt to read and write music. A prison board report of July 1984 showed that he had an unblemished disciplinary record. He rose above organisational conflicts and always subscribed to the view that each person was entitled to differing views on any matter. He valued the debates and education that took place, a key to his political life. An essay by Harry Gwala, Man and his Country, a basic introduction on Marxist materialist view of history and class struggle, played a huge role in Motlanthe’s political education. Whilst on the Island, he was recruited into the South African Communist Party (SACP). Gwala, apart from Govan Mbeki and Lawrence Phokanoka, is said to have had the greatest influence on him, on the Island. Little is known of his membership of the SACP. Following his election as Secretary General of the ANC in 1997, he pulled out of the SACP Central Committee but remained a member of the Dobsonville Branch. He continued to be a member of the SACP until 2001, when he let his membership lapse. This decision was shaped by the potential problems of holding leadership position simultaneously in the SACP and the ANC. On 14 April 1987, Motlanthe, Stan Nkosi and others were released from Robben Island. He and Mapula then stayed at her parents’ home in Meadowlands. On 1 June 1987, he began work at the National Union of Mineworkers (NUM) as an education officer. He remained at NUM for ten years. Whilst at NUM, he was elected as the first chairperson of the ANC’s PWV (later Gauteng) region. In 1992, he replaced Cyril Ramaphosa as the acting General Secretary of NUM. He worked hard with Walter Sisulu, whom he considered as a mentor, to defuse the political violence that was engulfing the country and in particular in KwaZulu-Natal. At the July 1987 Cosatu congress, NUM chose Motlanthe to present its proposal that Cosatu adopt the Freedom Charter. He was chosen because of his astuteness and ability to articulate the union’s proposal. On 9 August 1987, NUM embarked on the biggest strike in the history of the mining industry for three weeks. He soon realised that the theoretical ideas discussed on the Island had to be adjusted to the harsh practical reality. The union tasked him with coordinating support through the long strike. Following the strike he began conducting training for shaft stewards that at times kept him away from home for over a week, especially when he had to travel to the rural areas, staying in shacks or hostels. The course material he developed exposed miners to the harsh realities around them. He began a campaign highlighting health and safety issues through education. His political education course included a history of the ANC and the labour movement. Alongside this role, he was also active in the ANC underground as a trade unionist, the SACP and the ANC Interim Leadership. He was also elected onto Cosatu’s Central Committee. When the ANC’s banishment was revoked, he was appointed the ANC’s coordinator for the PWV region. Many people also believed that he would become the first premier of Gauteng, as he was the first ANC chairperson of the region. Motlanthe was concerned about the effect his absence was having on NUM whilst engaged in ANC work. He insisted on returning to NUM following Ramaphosa’s election as Secretary General of the ANC in July 1991. In January 1992, he was elected acting general secretary of the NUM and at the eighth congress in February 1994, he was formally elected to this post. Motlanthe and James Motlatsi (NUM President) were centrally involved in setting up the Mineworkers Investment Company in 1995. In 1995, the NUM established a Mineworkers Investment Trust (MIT) for which Motlanthe was one of the first directors as general secretary of NUM. By the time he left the NUM, the union had a reserve of R40 million, making it Cosatu’s richest union. He also played a leading role in creating the Mineworkers Development Agency to assist retrenched miners and their families. He also helped establish the JB Marks Educational Trust, which provides bursaries to miners and their dependants as well as the Elijah Barayi Memorial Training Centre in Johannesburg. For a while, he served on the executive committee of the Miners International Federation. Motlanthe was elected the Secretary General (SG) of the ANC at its Mafikeng Conference in December 1997 with Thabo Mbeki as its President. He was responsible for ensuring that the ANC implemented and carried out its policies and programmes. He was and is committed to the notion that strict accountability by ANC officials must be followed. At the ANC National General Council (NGC) in Port Elizabeth, 2000, he criticised lack of consultation and discussions between government and the ANC. There is a widely held viewpoint from colleagues and those close to him that Mbeki seriously undermined him for years, although Motlanthe denies it. His biographer, Ebrahim Harvey, writes that Motlanthe tended “to become strongly critical of the left of which he had been a leader in NUM and Cosatu.” Motlanthe held the view that the NUM [or the trade union movement] ought to remain independent, yet when Cosatu went on strike over the City of Johannesburg’s privatisation campaign, he condemned the organisation for it. Over HIV/Aids, Motlanthe is accused of regurgitating Mbeki’s, now widely discredited, denialist’s position. However, he changed his stance on ARVs following the government’s decision of a mass rollout programme. From 2002 to 2007 he continued to work hard to keep the ANC united, at the same time he was instrumental in attempting to establishing a political school and policy institute to educate leaders. To date there has been no success in this direction. In 2005, the Mail & Guardian newspaper reported on what is known as the “Oilgate” issue. The newspaper reported that Sandile Majali (now deceased) arranged for R15 million from Petro SA to be paid to his company, Imvume Management for oil condensate. This transaction was related to the United Nations (UN) Oil for Food Programme. The report went on to state that the money from the petrol company went to Majali’s company and was then diverted to the ANC for the Party to deal with its financial obligations. Motlanthe claimed that the ANC’s Finance Department was responsible for the financial dealings with Majali. As the SG of the ANC, his critics claimed that he ought to have known about this deal. The UN’s Independent Inquiry Committee (IIC) alleged that Motlanthe was involved with Majali in irregular business dealings in Iraq. Following, this former President Thabo Mbeki established the Donen Commission in 2005 “to investigate alleged illicit activities of certain South African companies or individuals relating to the UN food programme.” The commission did not interview Motlanthe. He has strenuously denied that he ever promised to pay surcharges [a euphemism for bribery fees] or requested same to be paid. Motlanthe has denied being present at any meeting with Majali in Iraq or that he agreed to pay Majali in kickbacks in any form. At the ANC’s 52nd Conference in Polokwane, Limpopo, in December 2007, Motlanthe delivered his last report as the SG, drawing attention “to organisational and political problems” besetting the organisation, which if not confronted would bedevil the organisation. Additionally, he also “castigated the ANC’s National Executive Committee [NEC] for its lack of involvement in mass work and in building the ANC and about ineffectual deployments.” He also reported on factionalism in the ANC and the problems that it presented to the organisation..
At the Conference, Zuma was elected the ANC’s President and Motlanthe as his Deputy President. A few days later, the National Prosecuting authority (NPA) reinstated charges of corruption against Zuma. On 12 September 2008, Judge Chris Nicholson found that the charges against Zuma were illegal and invalid (this was later overturned). This led to the charges being dropped against Zuma a few months before the 2009 elections. On 20 September 2008, the ANC’s NEC took a decision to recall Mbeki from office. Motlanthe and Gwede Mantashe were tasked to inform Mbeki of this decision. Mbeki tended his resignation the following day, on 21 September 2008. His approach was to ask the ANC to allow Mbeki “to complete his term of Presidency or to bring the 2009 elections forward.” However, he failed in his attempts to convince the ANC to change its position. In 2008, Motlanthe was mandated by the NEC chair to propose names for the ANC’s new Deployment Committee (DC). His approach to choose members to the DC was in favour of a merit driven one, which revealed opposition to his approach to this sensitive issue of deployment. Some members of the African National Congress Youth League (ANCYL) and the Young Communist League (YCL) mobilised against him. The ANCYL, especially, attacked him and found faults with him following his stance regarding the appointment of members of the DC. Following Mbeki’s defeat at the 2008 ANC Elective Conference, the ANC deployed Motlanthe to the Presidency, in spite of him [Motlanthe] being opposed to the move. He became an MP on 20 May 2008 and on 12 July 2008, he was sworn in as a Minister. 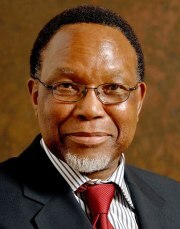 Motlanthe was installed as South Africa’s third President on 25 September 2008. Motlanthe has had to deal with controversies, which undoubtedly embarrassed him. The media widely published a story that claimed that he had an affair with a 24-year-old woman. The journalist who broke the scandal about the alleged affair later admitted that it was untrue. During his brief tenure, Motlanthe had to deal with the Vusi Pikoli matter. Vusi Pikoli, the head of the NPA, was suspended by Mbeki in 2007. Just prior to this Pikoli obtained an arrest warrant for the Commissioner of Police and head of Interpol, Jackie Selebi. The media speculated that Mbeki tried to shield Selebi. As President, Motlanthe recommended to Parliament that Pikoli be fired, even though the [Frene] Ginwala Commission of Inquiry advised otherwise. Motlanthe was widely criticised for his action by the Parliamentary Opposition and the media. He strongly denied that he succumbed to political pressure from the ANC. In 2010, South Africa hosted the World Soccer Cup. As part of the celebrations, the South African World Cup Committee asked South Africa’s three Nobel Peace Prize Laureates, Archbishop Desmond Tutu, former President F W de Klerk and Nelson Mandela, to invite the Dalai Lama (of Tibet) as a guest. The Dalai Lama applied for a visa to enter the country but he was refused entry by the Department of International Affairs and Motlanthe supported this decision. Motlanthe believed that since the Dalai Lama’s visit coincided with the 50th anniversary of the Tibetan Uprising and would “create serious problems between South Africa and China.” This controversial stance was roundly criticised by the media, the three Nobel winners and civil society, but this had no effect on the outcome. In 2008, Tutu and de Klerk petitioned Motlanthe to set up a Commission of Inquiry into the scandal ridden and controversial arms deal saga. Motlanthe did not do so and was again roundly criticised. Another issue, for which he was heavily criticised by both the Parliamentary Opposition and civil society, was the disbanding of the Directorate of Special Operations (DSO, also known as the Scorpions) in 2009. The ANC decided to merge the Scorpions into the South African Police Services. The disbanding of this unit had to comply with constitutional procedures, which was a lengthy process. The ANC criticised him for delaying the legislation that would terminate the Scorpions, but eventually he signed into law its demise. Even though the due Constitutional process was followed, the official Opposition believed that the long process was a ploy by the ANC to protect (its own) corrupt officials in government. The South African Broadcasting Corporation (SABC) Bill, which dealt with how SABC Board members were appointed and fired, was passed by Parliament in 2008. Once more, Parliament’s Opposition parties objected, claiming that the Bill held the Board accountable to Parliament and could thus effectively be fired by Parliament if it “did not affect Parliament’s wishes.” In this way, they claimed, that the SABC could not be an independent entity. Again, the ANC was eager for the Bill to be passed quickly. Motlanthe signed the Bill only after he was convinced that certain provisions, which were unconstitutional, were brought in line with the constitution. Another major crisis that confronted Motlanthe was the Telkom/Vodacom deal. The state telephone provider, Telkom “announced its sale of 15% of its stake in Vodacom (a mobile phone operator).” Motlanthe only signed the deal when he was guaranteed there would be no retrenchments of workers as a result. Again, he was subjected to criticism from the trade unions and from the media over the deal that he signed, even after he was satisfied that there was to be no job losses. Motlanthe had no ambition to occupy any government position in the 2009 elections. His aim was “to ensure that the new president is properly inaugurated.” For Motlanthe, “the ANC came first.” That Zuma chose Motlanthe for the position of Deputy President, in spite of him having no ambitions to run for any position, spoke volumes of the Motlanthe’s reputation. The ANC adopted a resolution at its Polokwane Conference to introduce a statutory media appeals tribunal. Again, there was a huge outcry from the public and a much publicised debate in the media. The ANC and the SACP argued in favour of the tribunal. The fact was that “the media had not grasped that this was not an ANC decision to impose a tribunal, but for Parliament to investigate if it was possible and desirable, in the light of the ANC’s concerns.” Again, Motlanthe adopted a conciliatory approach and adopted the position that it was desirable for the media to put in place self-regulatory mechanisms. Some in the ANC were not happy with this approach. The South African National Editors Forum (Sanef) decided to establish the Press Freedom Commission in an attempt to maintain self-regulation. The Protection of State Information Bill (POSIB), another highly contentious issue, was strongly opposed by the official Opposition, media and the public. The ANC rejected “the inclusion of a public interest clause in the Bill” despite strenuous opposition from all sectors of society. When the ANC rejected the public inclusion clause Motlanthe argued that “the clause does not exist anywhere in the world.” He also urged the ANC “not to ram the Bill through Parliament.” However, after strenuous objection from various quarters, the ANC’s MPs passed the Protection of State Information Bill, with proposed amendments, in the National Council of Provinces in December 2012. Another controversial issue into which Motlanthe was unwittingly dragged into was the Iran helicopter deal, which was published in the Sunday Times of March 2012. The paper stated that Gugu Mtshali, Motlanthe’s partner, was involved in a R 104 million bribe to obtain support for a South African company attempting to sell helicopters to Iran in violation of sanctions. The company’s director stated that he had met Motlanthe, although the Deputy President denied this. In an attempt to clear his name, he took the matter to the Public Prosecutor to investigate. The Public Prosecutor’s report did not implicate him or Mtshali. As Deputy President in Zuma’s cabinet, he has a punishing workload and schedule, which he manages to attend. Deeply respectful of both colleagues and members of the Opposition he has won the deep respect of all who have encountered him. He is deeply pained by people going into Parliament and then engaging in acts of corruption. In this respect, he can be quite critical of his own Party. Following Zuma’s election in 2009, the ANCYL and Julius Malema drifted apart. Zuma owed much to Malema and the ANCYL for his success in being elected as the head of the ANC in Polokwane. A one stage Malema declared that he was prepared “to kill for Zuma.” However, by 2008, Motlanthe warned that Malema and ANCYL leaders were “to be reigned when they behaved unacceptably.” Motlanthe himself had been at the receiving end of the ANCYL and Malema criticisms. Tension between Zuma and Malema was exacerbated following the public sector strike in 2010. Following Malema and the ANCYL’s attack on the Botswana government, he (and other leaders) were expelled from the ANC. Motlanthe felt that Malema ought not to have been expelled but rather the ANC should have engaged with the errant ANCYL members. Malema was expelled from the organisation in 2011. Motlanthe has been nominated for the positions of President, Deputy President and NEC member of the ANC at its forthcoming national elective conference in December 2012, at Mangaung, Free State. Media reports state that Motlanthe will be standing for election at this conference. • A Concise Dictionary of South African Biography, Cape Town: Francolin, p. 187.